Cutaneous metastasis (CM) from underlying carcinoma is relatively uncommon in clinical practice, 5.3%. Breast carcinoma (69%) is the most common cause of CM in women, followed by carcinoma of the large intestine (9%), lungs and ovaries (4%). These lesions often mimic benign skin lesions and present as localized nodules (most common), cicatricial plaques, fibrotic plaques, alopecia neoplastica, zosteriform eruptions and bullous lesions. ,,, A high index of suspicion is required to diagnose these lesions as clinical findings may be subtle. Fine needle aspiration cytology (FNAC) is commonly employed for diagnosing these skin lesions. However, it is often difficult to aspirate adequate material from small papular lesions. In these clinical situations, fine needle non-aspiration cytology (FNNAC) is proposed as an alternative procedure. FNNAC eliminates the negative suction pressure employed in FNAC and decreases the dilution of tumor cells by blood and hence yields adequate diagnostic material. We report here a case in which FNNAC was used in place of FNAC in diagnosing papular skin lesions. This procedure was carried out in a treated patient of carcinoma breast who was on regular follow-up and presented to us with a 20-day history of papular skin lesions over her chest and back. A 48-year-old woman was diagnosed with invasive ductal carcinoma of the left breast 4 years ago. She received neoadjuvant chemotherapy, followed by left modified radical mastectomy. After that, she underwent adjuvant chemotherapy and radiotherapy. She was put on hormone therapy and was on regular follow-up for the last 4 years. From the last 20 days, she was complaining of painful erythmatous papular skin lesions over her chest and back. 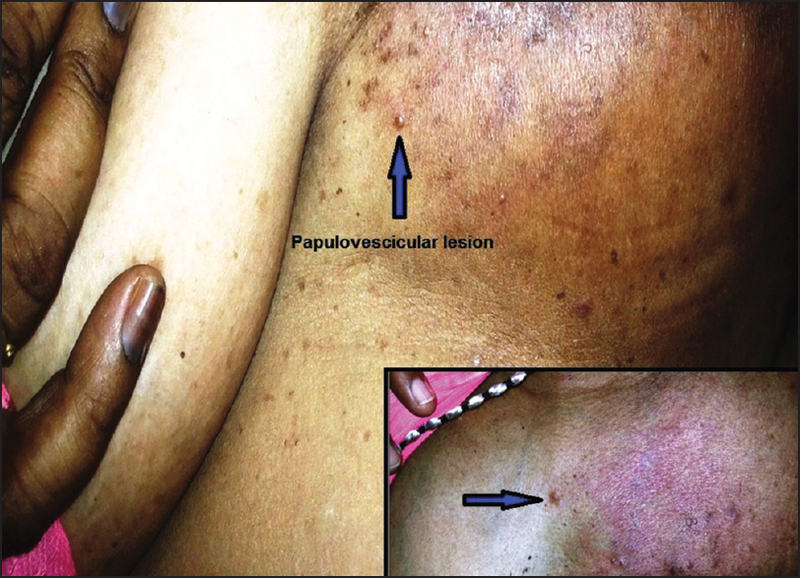 Physical examination revealed multiple round-oval papulovescicular, tender cutaneous lesions ranging in size from 0.2 cm to 0.5 cm in the background of diffuse erythema, scattered over the left side of the chest wall, anterior abdominal wall and back [Figure 1]. The remainder of the physical examination was unremarkable. A high index of suspicion for recurrence was made and the patient was advised for FNAC by the clinician. Fine needle aspiration was not successful in this case as the lesions were very small, difficult to fix and yielded inadequate material. Alternatively, FNNAC was performed from the chest wall and back lesions to get adequate material. Cytology findings were similar from both sites and revealed sheets of pleomorphic cells with a high nucleo-cytoplasmic ratio and prominent nucleoli forming a glandular pattern [Figure 2]. Diagnosis of cutaneous metastases from breast carcinoma (CMBC) was suggested. In our case, FNNAC provided an adequate sample for cytological diagnosis. Maurya et al. in his study also found that non-aspiration sampling has more cellular material, less blood, less cellular trauma and better retention of architecture. However, he concluded that better diagnostic accuracy can be achieved by combining both the techniques. This article enlightens the clinicians about the utility of FNNAC, which is a relatively uncommon procedure. However, it is indicated in certain clinical situations like in this case. Krathen RA, Orengo IF, Rosen T. Cutaneous metastasis: A meta-analysis of data. South Med J 2003;96:164-7. Johnson WC. Metastatic carcinoma of the skin: Incidence and dissemination. In: Elder D, Elenitsas R, Jaworsky C, Johnson Jr. B, editors. Lever's Histopathology of the Skin. 8 th ed. Philadelphia: Lippincott-Raven;1997. p. 1011-8. Lookingbill DP, Spangler N, Helm KF. Cutaneous metastases inpatients with metastatic carcinoma: A retrospective study of 4020 patients. J Am Acad Dermatol 1993;29:228-36. Chisti MA, Alfadley AA, Banka N, Ezzat A. Cutaneous metastasis from breast carcinoma: A brief report of a rare variant and proposed morphological classification. Gulf J Oncolog 2013;1:90-4. Gade JN, Kimmick G, Hitchcock MG, McMichael AJ. Generalized cutaneous metastases from breast adenocarcinoma. J Am Acad Dermatol 1997;37:129-30. De Giorgi V, Grazzini M, Alfaioli B, Savarese I, Corciova SA, Guerriero G, et al. Cutaneous manifestations of breast carcinoma. Dermatol Ther 2010;23:581-9. Gupta RK, Naran S. Fine needle aspiration cytology of cutaneous and subcutaneous metastatic deposits from epithelial malignancies. An analysis of 146 cases. Acta Cytol 1999;43:126-30. Zajdela A, Zillhardt P, Voillemot N. Cytological diagnosis by fine needle sampling without aspiration. Cancer 1987;59:1201-5. Santos JE, Leiman G. Nonaspiration fine needle cytology. Application of a new technique to nodular thyroid disease. Acta Cytol 1988;32:353-6. 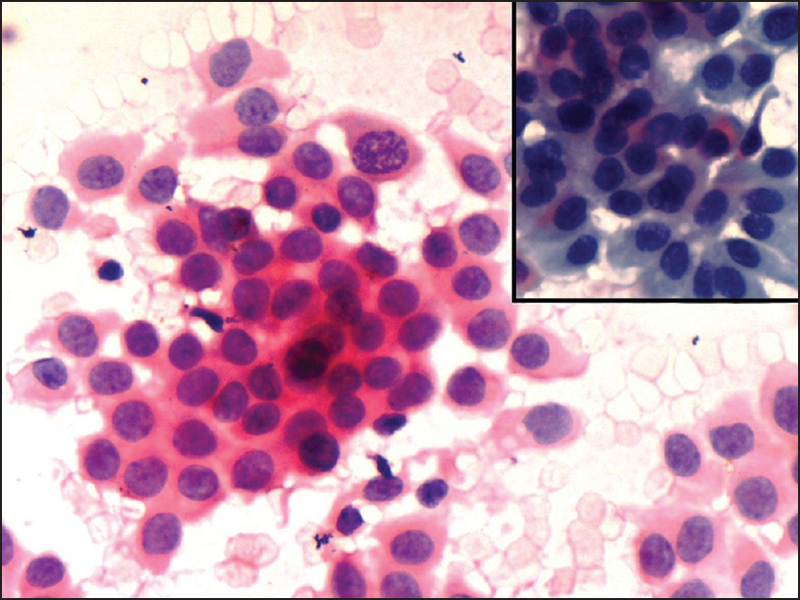 Maurya AK, Mehta A, Mani NS, Nijhawan VS, Batra R. Comparison of aspiration vs non-aspiration techniques in fine-needle cytology of thyroid lesions. J Cytol 2010;27:51-4.